is affordable and financially sustainable in the long term. Over the years, Hong Kong has developed a highly efficient healthcare system and achieved impressive health outcomes for its population. The standard and quality of our healthcare services enjoy renowned international standing, stay at the forefront of advances in medical technology, and compare favourably with other advanced economies. proactively support the development of Chinese medicine. Over the past decades, Hong Kong has developed a healthcare system that is renowned for its high efficiency and high-quality services. We are now ranked among the best in the world in terms of many health indicators. For example, our infant mortality rate has dropped from 18.4 per 1 000 registered live births in 1971 to 1.6 in 2017, while life expectancy at birth has increased from 67.8 years for males and 75.3 years for females in 1971 to 81.7 years and 87.7 years respectively in 2017. We anticipate that the life expectancy will further increase to 87.1 years for males and 93.1 for females by 2066. Further, our health indicators compare favourably with those of the Organisation for Economic Co-operation and Development countries. Their average infant mortality rate was 3.9 per 1 000 live births while ours was 1.6. The life expectancy at birth for males was 77.9 years and females was 83.3 years in 2016, whilst ours is 81.7 years and 87.7 years respectively. For doctors who are interested in biomedical research, I am pleased to share with you that Hong Kong has a vibrant community of some 100 international and local biomedical technology companies in the Hong Kong Science Park. The Hong Kong Eye Hospital, Queen Mary Hospital and Prince of Wales Hospital are the three hospitals located outside Mainland China accredited by the National Medical Products Administration (formerly the China Food and Drug Administration) to carry out clinical trials in a number of specialties for drug registration purposes in Mainland China. We also have attracted renowned institutions to establish a presence in Hong Kong including the first MIT (Massachusetts Institute of Technology)'s overseas Innovation Node, the first Karolinska Institutet overseas research facility, the Guangzhou Institutes of Biomedicine and Health, Institut Pasteur of France and Nordic Innovation House. Sixteen Partner State Key Laboratories from Mainland China have also been set up in Hong Kong and two-thirds of them specialise in biomedical technology and related areas. We are also proud of our research capabilities. Four universities in Hong Kong (the University of Hong Kong, the Hong Kong University of Science and Technology, the Chinese University of Hong Kong and the City University of Hong Kong) rank among the top 100 in the 2019 QS World University Rankings. the remainder "international standing" or "regional standing". Two medical schools (i.e. the University of Hong Kong and the Chinese University of Hong Kong) have each established a clinical trials centre, providing services for Phase 1 to Phase 4 clinical trials. HKU - Clinical Trials Centre (University of Hong Kong Clinical Trials Centre) has facilitated over 1 000 sponsored clinical studies and 170 investigator-initiated clinical studies in collaboration with more than 230 sponsors around the world as well some 100 clinical investigators of HKU and other hospitals and clinics in Hong Kong. CUHK - Clinical Trials Centre (Phase 1 Clinical Trial Centre, Chinese University of Hong Kong) conducted over 1 000 sponsored clinical trials. Hong Kong's healthcare system operates along a dual track. The public system serves as a safety net for Hong Kong residents providing highly subsidised (nearly 94 per cent of the costs involved) in-patient services to all. The private sector complements the public sector by offering those who can afford and are willing to pay faster access to personalised services at their own expense. Our healthcare system is supported by teams of dedicated healthcare professionals. As of June 2018, we had over 100 000 healthcare professionals from 13 professions that are subject to statutory registration. About half of the doctors work in the public sector including the Hospital Authority, Department of Health (DH), and academic and subvented organisations. Let me first introduce the two important pillars of our healthcare system. The Hospital Authority is a statutory body responsible for managing Hong Kong's public hospital services. The HA provides nearly 90 per cent of all in-patient services and around 30 per cent of out-patient services in Hong Kong. It manages 43 hospitals and institutions, 48 Specialist Out-patient Clinics (SOPCs), and 73 General Out-patient Clinics (GOPCs). The HA also has a workforce of about 76 000 and provides a total of 28 329 beds. With the vision of our population staying healthy, the HA ensures that all members of the community have access to comprehensive, affordable, highly professional and people-centred preventive, curative and rehabilitation healthcare services. The Department of Health is the Government's health adviser and agency to execute health policies and statutory functions. The DH safeguards the health of Hong Kong people, with core functions including disease prevention, health promotion, health service provision and statutory function or regulatory work. The Department also operates a number of clinical health services such as maternal and child health centres, chest clinics, etc. As at August 2018, we have a total of 200 clinics or health centres under the Department's purview. Our private healthcare sector is vibrant. As of July 2018, we have 12 private hospitals providing 4 640 beds. They are registered under the Hospitals, Nursing Homes and Maternity Homes Registration Ordinance (Cap. 165). The Department of Health conducts inspections of private hospitals regularly. The Voluntary Health Insurance Scheme will tentatively commence in April 2019 to encourage procurement of certified indemnity hospital insurance products and make use of the insurance coverage to use private healthcare facilities. In addition to private hospitals, the survey conducted by the Department of Health in 2016 reveals that there are around 500 private day procedure centres and about 5 000 private medical and/or dental clinics in Hong Kong. With a view to better regulating private healthcare services amid the evolving landscape of healthcare services, we have conducted a root-and-branch review of the regulatory regime for private healthcare facilities. The Private Healthcare Facilities Bill was introduced into the Legislative Council in June 2017. The Bill will provide for a new premises-based regulatory regime, covering private healthcare facilities including hospitals, day procedure centres and clinics. The Legislative Council has completed scrutiny of the Bill. It is our target to have the Bill passed by the Legislative Council within 2018. The HKSAR Government is committed to investing in healthcare. Our total health expenditure increased from 3.6 per cent to 6.0 per cent of Gross Domestic Product (GDP) over the period from 1989-90 to 2014-15. As a percentage of total health expenditure, public health spending over the same period rose from 40 per cent to 50 per cent. 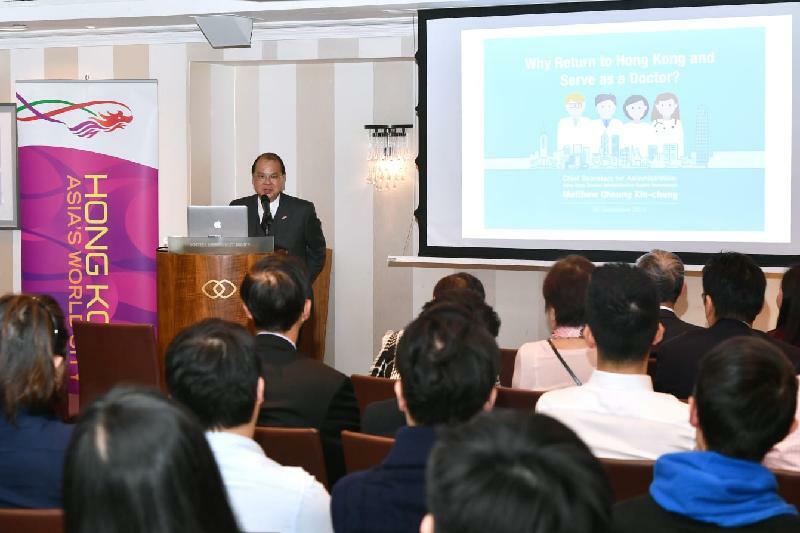 This year, the government recurrent expenditure on health increased to HK$71.2 billion or 17.5 per cent of the Government's total recurrent expenditure. The amount represents an increase of 13.3 per cent over last year or annual growth of 8 per cent over the past 10 years. To help meet the services demand for hospital services, we have allocated HK$6 billion in this year's Budget to the HA to increase hospital beds and operating theatre services, and improve general and specialist outpatient services. And from this year onward, we have allocated an additional HK$200 million annually to the HA to enhance professional training for our clinical professions. To encourage research and development (R&D) in Hong Kong, we attach great importance to research funding for our universities. University Grants Committee (UGC)-funded universities' research expenditure amounted to HK$10.27 billion, representing 0.4 per cent of Hong Kong's GDP (2016 figure). In parallel, the Innovation and Technology Fund supported nearly 470 biotechnology-related projects amounting to HK$916 million, covering bioinformatics, stem cell therapy, molecular diagnostics, drug discovery and development, modernisation of traditional Chinese medicine, and biopharmaceutical manufacturing as of March 2018. The current-term of the HKSAR Government has committed to the target of doubling the Gross Domestic Expenditure on R&D from 0.73 per cent to 1.5 per cent of GDP (i.e. HK$45 billion) by 2022. Funding commitment from the Government is ever increasing and we have set aside no less than HK$10 billion to create two world-class research clusters on healthcare technologies. We see the need to make forward-looking planning in light of the increasing demand for healthcare services. We have promulgated the first Ten-year Hospital Development Plan (HDP) in consultation with the HA. As announced in the Chief Executive's 2016 Policy Address, the Government set aside HK$200 billion for the HA to implement a Ten-year Hospital Development Plan. The ten-year plan covers the construction of an acute general hospital, redevelopment and/or expansion of 11 hospitals, and construction of three community health centres and a supporting services centre. The first Ten-year HDP will provide around 5 000 additional public hospital beds, over 90 new operating theatres, and significant increase in the capacity of specialist outpatient clinics and general outpatient clinics, as well as other hospital facilities. To add further impetus to our hospital development in a bid to improve our healthcare services in the long run, we announced in this year's Budget that the HA will start planning the second Ten-year Hospital Development Plan. In this regard, a sum of HK$300 billion has been set aside as an initial provision to support the second Ten-year Plan. The Plan aims to develop a new hospital at King's Park in Kowloon, re-development of a number of public hospitals including Princess Margaret Hospital and Tuen Mun Hospital, as well as improving Department of Health's clinical facilities, and upgrading and increasing healthcare teaching facilities. Today, one in six people, or 1.2 million people in Hong Kong, is aged 65 or above. By 2066, it will be over one in three or 2.06 million people. As for the group of "old-olds" or elderly people aged 85 or above, they will be more than doubled from the current 199 000 to around 770 000 by 2066. It is also expected that three out of five people turning 65 today will live to 85 or beyond and two of them to at least 90. As our society ages, there is more demand for healthcare services. Technological advancement and higher expectations for healthcare services have added to the ever-increasing demand. Today, our elderly dependency ratio is 239. But by 2066, it will be 579. There is a need for more healthcare professionals to cope with the challenges. The provision of healthcare services depends heavily on the supply of healthcare professionals. However, healthcare training takes times - it needs at least 13 years to train a specialist. If a shortage is likely to persist for a prolonged period, we have to act swiftly to ensure a steady supply of healthcare professionals to join and serve in the public sector in the short- and medium-term, while waiting for the long-term measures to take effect. To better prepare ourselves to overcome the manpower gaps, the Government published the report of the Strategic Review on Healthcare Manpower Planning and Professional Development in June 2017. The report points out that we will face a shortage of doctors in the short- and medium-term. At present, we have around 285 full-time manpower gap. In two years' time, the gap will be widened to 500. By 2030, about 12 years from now, the gap will be doubled further to over 1 000. It is the HKSAR Government's policy that locally trained healthcare professionals should be the bedrock of our healthcare workforce. In the face of the manpower gap confronting us, we have increased the number of medical training places from 250 to 470 over the past decade. For this year, by end-August 2018, we have 419 locally trained new doctors joining the HA. We will continue to identify ways to increase the number of medical training places. The HA has also adopted a higher retirement age of 65 for new recruits commencing employment on or after June 1, 2015. They have also started to rehire retired healthcare professionals for two years up to 62 on a pilot basis to relieve manpower shortage. However, we still anticipate a significant manpower gap in the healthcare system in view of the fast-ageing population and the major expansion of our hospital capacity through the two Hospital Development Plans. We consider it necessary to recruit qualified, non-locally trained doctors in the short-and medium-terms. Hong Kong Children's Hospital is scheduled to commence services in phases starting from the fourth quarter of 2018. We welcome any non-locally trained doctors to serve at this state-of-the-art hospital. It will serve as a tertiary specialist hospital for the management of complex paediatric cases, working closely with the existing 13 paediatric departments in the HA hospitals through a hub-and-spoke model to form a co-ordinated service network. Hong Kong Children's Hospital will have a total planned capacity of 468 in-patient and day-patient beds, operating theatres, ambulatory surgery/day procedure centre, integrated rehabilitation centre and child development assessment services, children recreation and play therapy areas, family rest area, as well as research and training facilities. Let me give an overview on the opportunities in the Department of Health. With the passage of the Medical Registration (Amendment) Bill, the contract period for doctors in the Department has been extended to three years, with a starting point, say, from HK$61,060 to HK$89,460 per month, plus 15 per cent end-of-contract gratuity. We hope this helps improve the Department's flexibility in recruiting suitable doctors for Hong Kong. The Department also offers specialty training opportunities. Contract doctors may be posted to clinical or public health services. The Department also facilitates its doctors to advance in their medical careers. Facing manpower shortage, the HA is recruiting Service Resident and Associate Consultant positions for certain specialties facing serious manpower shortage such as Anatomical Pathology, Cardiothoracic Surgery and Radiology etc. There are various advantages of working in the HA. Today, we also have our HA Chairman, Professor John Leong, here and his team will provide more information on the opportunities for non-locally trained doctors in the public hospitals in Hong Kong. There are two main channels for non-locally trained doctors to practise in Hong Kong. One of them is the Licensing Examination which is administered by the Medical Council of Hong Kong. Another is applying Limited Registration that allows non-locally trained doctors to work in certain specified institutions, including the Hospital Authority, the Department of Health and the two medical schools (the University of Hong Kong and the Chinese University of Hong Kong). We have been working with the Medical Council to explore ways to provide more flexibility for non-locally trained doctors to work in Hong Kong. For the Licensing Examination, the Medical Council has increased the frequency of examination from once a year to twice a year. The Medical Council has also refined exemption for clinical examination. Applicants with substantial experience may be exempted from one of the four disciplinary examinations, i.e. surgery, medicine, obstetrics, and gynaecology and paediatrics. For non-locally trained doctors with specialist qualifications, the internship training requirement can be shortened from one year to six months. The Medical Council will soon launch the Virtual Education Centre (in third quarter of 2018) to improve the transparency of the Licensing Examination. The Centre aims to provide more information on the Licensing Examination so that candidates could have a better understanding of the scope of the examination. The Centre will also provide reading materials, videos on the Clinical Examination format and other information about the Licensing Examination. The HKSAR Government is working hard on the legislative front to improve our healthcare system. The Medical Registration (Amendment) Ordinance was enacted on April 6, 2018. One of the objectives of the Amendment Ordinance is to extend the validity period and renewal period of Limited Registration from not exceeding one year to not exceeding three years. With this new facilitation measure, we expect that more flexibility can be provided to facilitate practice of qualified non-locally trained doctors in Hong Kong under Limited Registration to alleviate our imminent manpower shortage. We welcome qualified non-locally trained doctors to work in Hong Kong through passing the Licensing Examination or under the Limited Registration arrangement. Alternatively, non-locally trained doctors with acceptance qualifications and proven experience, and who have been selected for employment by the HA, the Department of Health or the two medical schools, may submit applications to the Medical Council for Limited Registration in Hong Kong. From last year, we have extended the validity period of Limited Registration from one year to a maximum of three years. As at the end of 2017, there were 144 Limited Registration doctorates in Hong Kong. Before I pass the mic to Professor Leong to give an in-depth presentation on the opportunities in the HA, I would like to show you a video summarising the vibrant, high-quality and flourishing healthcare sector in Hong Kong. Through today's exchange and discussion, I hope you will have a more thorough understanding of the vast and bright career opportunities for non-locally trained doctors to serve in Hong Kong.